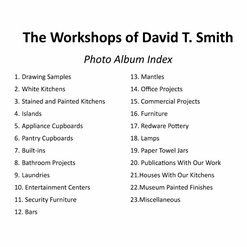 When you have a reproduction New England Saltbox and you want to update/upgrade your kitchen the Workshops of David T. Smith is the choice to make. We did and were absolutely amazed at the detail of design, color and finishes offered by David and his team. Our experience was outstanding and the results fantastic! 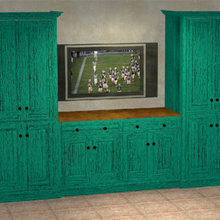 I have also worked with the Workshops for custom reproduction furniture. After trying for several years & talking with numerous kitchen remodelers, we selected David T. Smith to handle our kitchen make-over. We have a relatively small kitchen & needed to maximize the storage space while at the same time reconfiguring our kitchen so that it was far more functional than when it was first built in the early 1960's. David did all of this & more giving us an incredible kitchen that we are still thoroughly enjoying 12 years after the fact. Our family & friends continue to be both amazed & impressed while we continue to thoroughly enjoy the work that David & his team performed for us well over a decade ago. Commenting on this project a decade after the fact gives us the opportunity to note that David's work has stood the test of time & the quality of his workmanship has held up tremendously; something that other friends have not experienced from their pre-fabricated/standardized kitchens. We also still enjoy the fact that we are not just another kitchen with cheery cabinets & granite countertops which represent 99% of the kitchens that you see today - more of the same with just slight variations. 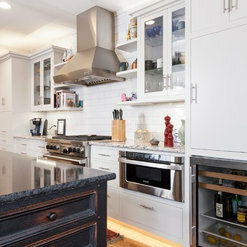 The 18th century styling, outstanding finishes, & superb design that David provides make him one of the most unique if not the most unique kitchen designers in the country. David gave us what we wanted, more than we wanted, with outstanding quality, designs, & features that have, again, stood the test of time & will no doubt continue to do so for decades to come. Too bad we can't give him a 10-star rating! David did an outstanding job on our log home kitchen. When the kitchen arrived, you could see the quality in the craftsmanship right away. Now that I've been in the home and using the kitchen for 3 months, I couldn't be happier. 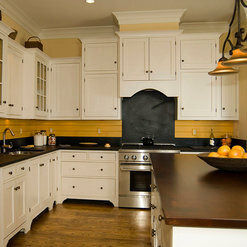 The cabinets are not only beautiful, but you can feel the quality every time you open them. 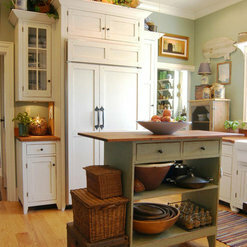 David knows exactly how to give a kitchen the look and feel you are going for. 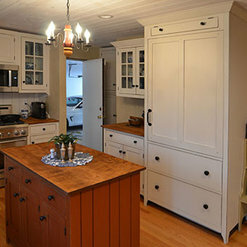 David Smith and his crew have created and installed two kitchens for two of our homes in CT and on the shore in RI. Both are perfect. We are proud of the kitchens and enjoy having our friends gaze in amazement. 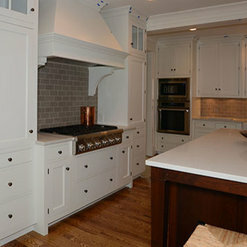 David's team showed up on time and quickly and perfectly installed the kitchens with no errors. David is very creative, understanding and easy to work with. He's an expert. The kitchens are like no other. They are unique and will have a long term value. I do not believe they will be going out of style any time soon. I recommend him highly. 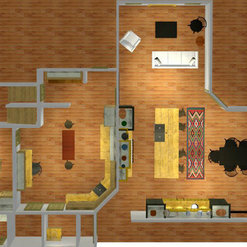 David T. Smith designed and built a remodel of our kitchen. I had known of his craftsmanship for many years and already owned several of his pieces. To say that we were happy with the results would be a gross understatement. The kitchen is nothing short of a masterpiece and a dream come true for us. The fact that anyone who sees our kitchen assumes that we used real antiques is a testament to the mastery of his craftsmanship. I have continued to do business with him since and would recommend him without hesitation. 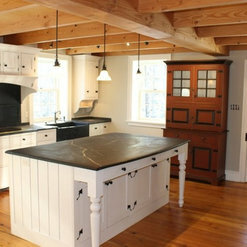 We did a large addition/renovation of our 1770’s farmhouse with the kitchen being of primary concern. 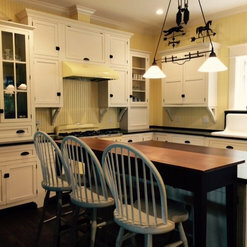 After extensive review of many reputable custom kitchen cabinet and furniture makers, we choose David T. Smith and could not be more delighted with the outcome. We faced several challenges, many obstacles, and numerous limitations; but David and staff handled each challenge with confidence and professionalism that exceeded our expectations. We were so pleased with David and staff that we had them custom make several other items for us such as, bar cabinets, bathroom vanities and cabinetry, dining table, desk and file cabinet, and even a bed for the master bedroom. If you are looking for experienced professionals and one of a kind custom cabinetry and furniture maker, David T. Smith is no doubt the best. Deserves the 5-star rating. Excellent workmanship; excellent design. He's also made two vanities, library cabinets and shelves, and a display shelf for us. He has an extremely extensive library of country/shaker/primitive pieces from which to gather inspiration. Dave is very good at designing, and is very patient with making iterative design changes to achieve exactly what the customer wants. Cannot say enough good things about Dave and this crew. There is nobody else in Dave's league. David and his team (Gregg, etc.) were fantastic to work with. We love the end product. But we loved the process just as much. We had a unique project (complete kitchen remodel in a 100 year old cabin in Colorado) with a very specific look in mind. Looked around a lot at high end kitchen designers, ready made kitchen models. etc. the whole range. Found no one and no place that understood our vision for detail, quality and personality that The Workshops of David T Smith did. We don't live near David's workshops and our kitchen was in a vacation home so we really appreciated the ability David has to work virtually. Both in his technology and his mindset/process. Our process started with David doing presentations to us in virtual meetings to educate us on all the nuance of kitchen craftsmanship and options. Progressed to a design has where David quickly brought our vision to life. Loved seeing the very frequent photos that he and his team provided along the way straight from the workshops themselves. We made a trip to the Workshops during the process to finalize detail decisions. This was an absolute highlight. We were treated like family at the Workshop, not just a customer of a business. We could not be happier with the way our kitchen turned out. Worth the expense and the time invested as we feel like we got something that perfectly fits the personality of our cabin, that is truly unlike any other kitchen and laced with very specific details and touches that will be part of our family cabin forever. 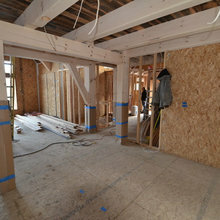 We were fortunate to have David and his crew provide cabinetry for our kitchen, laundry and all bathrooms. David was a pleasure to work with. All designs were brought to life on a computer allowing us to see the finished product ahead of time. You won't find finishes like this anywhere else. David T Smith is a true artist. 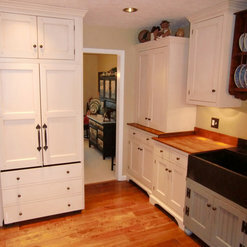 His cabinetry is impeccable. You will not find a more reputable company. They make your dreams and visions a reality. I had a great experience with David T Smith and his staff. They worked very hard to provide us with a kitchen that was perfect for the size and the features we wanted in our kitchen, very good quality with the rustic finish. 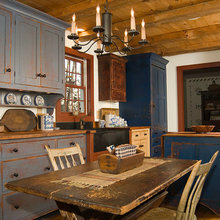 Commented: What paint color is the large colonial blue cabinet?it is my custom paint we call it William Blue. 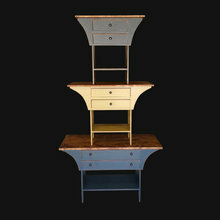 Commented: cabinetry is beautiful. 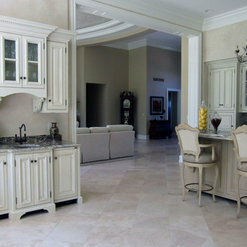 What is color of surround?it is,one of our custom colors Oatmeal. Commented: How wide is the cabinet at the end of the island? I love this idea!it's about 40 inches wide. Commented: Countertop is very niceThis was a top that was used in a laundry room. The client wanted a more primitive look so we used poplar with a Time Worn Finish. We usually use cherry or curly maple for our kitchen counter tops. Commented: RefrigeratorThis is a "fully integrated" fridge. it is made for a door like this. They cost more than a regular fridge. You can't do this with a regular fridge.